I decided to take a couple of days off while Holly was at music camp so I could do both Mt Moriah and Middle Carter on an overnight at the Imp Campsite. The weather was predicted to be perfect for both Thursday and Friday, so this was the right time. It took me about 3-1/2 hours to make the drive from home up to Gorham, where I stopped to call home and hit the bathroom. A quick drive brought me to the Stony Brook Trailhead, where there were already three or fours cars. This is a small lot tucked in between the woods and a rural residential area, a few miles south of the AMC Pinkham Notch Visitor's Center. The trail crossed a small footbridge and began following the course of Stony Brook through a mostly hardwood forest. Red baneberry was growing along the trail in several places; I was surprised that the flowers were already past and the berries brilliantly cherry red and ripe looking. The water level in the Stony Brook was rather low, and most side streams flowing into it were either dry or a scant trickle. It had been a fairly dry summer, and the winter snowfall had been far below normal. I hoped that I wouldn't have any trouble getting water over the next couple of days. Just beyond a mossy brook bed, the trail became steeper, ascending another mile through the fragrant boreal forest to the junction with the Carter-Moriah Trail. Surprisingly, I even got there about twenty minutes ahead of book time. Stony Brook Trailhead. 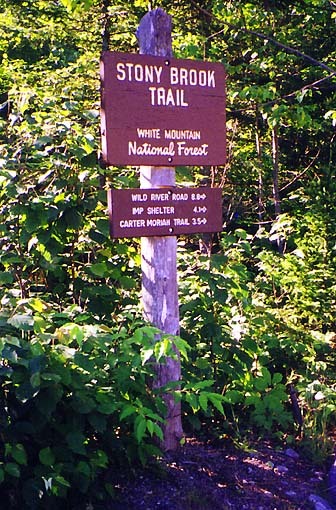 Located about halfway between Gorham and the AMC Pinkham Notch Visitor's Center, the Stony Brook Trail begins at a small parking lot near a residential area. 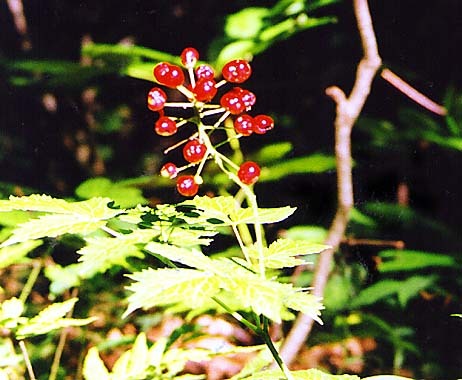 Red baneberry. This plant grows at lower elevations in the White Mountains. Although pretty, it's berries are extremely poisonous. 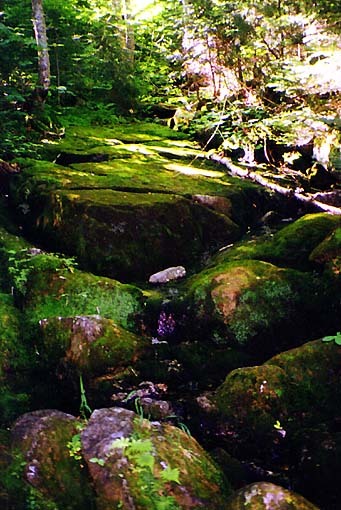 Mossy brook bed. This brook probably flows a lot stronger under normal conditions, but a dry summer had made most water levels particularly low. 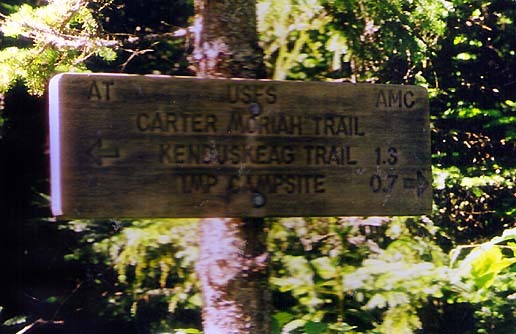 Carter-Moriah Trail junction. 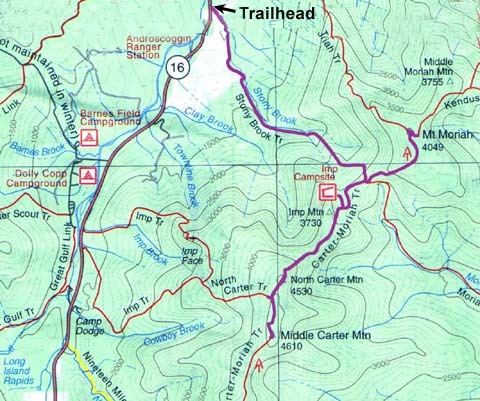 The Stony Brook Trail meets the Carter-Moriah Trail at a col below the Mt Moriah ledges.